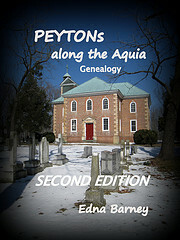 The story and lineage of Robert PEYTON and his wife Ann RUSH is on pages 75 and 76 of “PEYTONs Along the Aquia” by Edna Barney, 2004. Does anyone know the names of the children of Philip Ballard. I believe that he is the father of Delpha Ballard who married Robert Cummins in 1795 in Albemarle? Also her relationship to William Ballard who moved to Monroe County WV in 1793 and was the progenitor of a large line of WV Ballards. Carol – Philip Ballard is listed with six white souls on the first census of the United States, 1785, in Albemarle County, Virginia and I have come across a few land records for him. 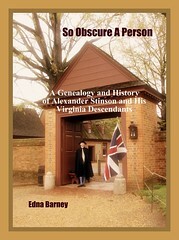 Others have credited with a number of Ballard children in Albemarle County, although I have not researched these. One was said to be Philadelphia “Delphia” Ballard who married Robert Cummings. I have no verification for this, so perhaps someone will post here a clue. I am interested in what you have about Delpha Ballard. Do you have any sources for information on her and her husband? As to William Ballard in West Virginia, I know nothing. In census records and court records there are more children for Robert and Ann PEYTON since the publication of my genealogy book, “PEYTONs Along the Aquia,” where on pages 75 and 76, I gave a glimpse of their history and their one daughter Ann PEYTON. Ann married into the COCHRAN family and it was her son who left a bible record of the COCHRAN descendants of the PEYTONS Along the Aquia.